Pakistan’s first female fighter pilot died yesterday from injuries sustained when her twin-seat fighter aircraft crashed near Kundian, Mianwali in Punjab province Tuesday afternoon. A Pakistan Air Force FT-7PG flown by Squadron Leader Saqib Abbasi and co-pilot Flying Officer Marium Mukhtiar was on a routine operational training mission when it “crashed near Kundian (Mianwali),” the PAF said in a press statement. “Both pilots handled the emergency with professionalism and courage and tried to save the aircraft till the last minute, ensuring safety of property and the civilian population on the ground,” the PAF statement reads. However, the PAF later confirmed that Mukhtiar succumbed, at a nearby military hospital, to injuries sustained during ejection. 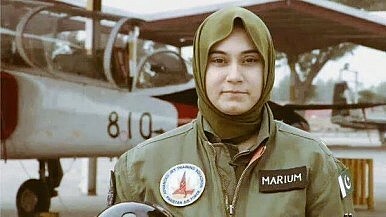 Mukthtiar was 24 years old and one of about 20 female fighter pilots serving in the PAF. The military only allowed women to join the PAF in 2006. Pakistan’s archrival, India, will induct its first female fighter pilots in 2017 (See: “India: Air Force to Induct its First Female Fighter Pilots in 2017”). Mukhtiar was laid to rest with full military honors in Karachi on November 25. Earlier that day, her flag-draped coffin was received by PAF’s Air Chief Marshal Sohail Aman and other senior officers at Faisal Air Base. The PAF FT-7PG, a variant of the Chinese Chengdu F-7, is fitted with Martin Baker Mk10 zero-zero ejection seats, according to a Pakistani aviation expert interviewed by Defense News. “It is a zero-zero seat, but these have to be activated in level flight at zero level (ground). If there is a rate of descent, the minimum ejection height goes up, proportionately. In this case, the aircraft was low, on final approach, and the rate of descent apparently did not allow enough time for the parachute to blossom fully,” Kaiser Tufail, a former PAF pilot, told Defense News. Activist Syed Ali Abbas Zaidi is taking Pakistan’s streets by storm with rickshaws that promote peace.